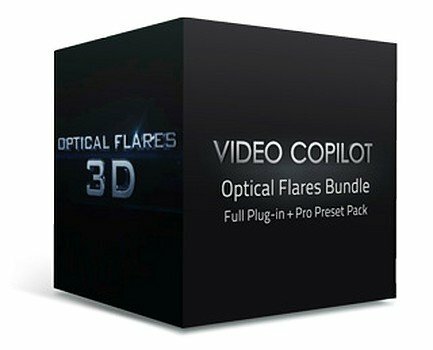 Video Copilot: PRO FLARES BUNDLE - это творческая мастерская для создания визуальных эффектов на основе оптических бликов, включает в себя Optical Flares - плагин для After Effects, а также пакеты дополнительных пресетов (Pro Presets 1 и Pro Presets 2), расширяющие его возможности. Optical Flares позволяет делать реалистичные эффекты вспышек линз (lens flares), ослепляющие блики, эмулировать свет прожектора, и много другое..., изменять и настраивать эти эффекты с поразительной скоростью и простотой. Video Copilot: PRO FLARES BUNDLE - Creative Lens Flare Studio includes Optical Flares, Pro Presets 1 and Pro Presets 2. Optical Flares is plug-in for designing and animating realistic lens flares in After Effects. Build, Edit and Customize Lens Flares with amazing speed and simplicity. PRO PRESETS 1 for Optical Flares - Powerful Preset Pack for Optical Flares (optional) The Pro Presets is a collection of 50 detailed high-end flares set up with shimmer animation, edge flare-ups and more. This collection offers greater versatility to the 60 built-in presets as well as providing creative ideas and usage of elements. Also, each object can be saved and combined with your other lens flare presets. PRO PRESETS 2 for Optical Flares - Choose from 50 unique new presets or mix and build new combinations. This new collection of lens flare presets have been inspired by many sources and designed with careful attention to detail. These flares are made up of countless lens objects and allows you to build creative hybrid combinations with flares from your own collection. Pro Presets 2 Installs in a few seconds giving you access to a artistic array of light effects. Pro Presets 2 are designed to be used with Optical Flares.